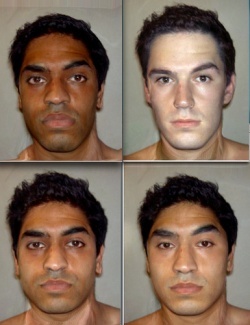 Clockwise from top left: "Afro-Caribbean", "Caucasian", "East Asian", "West Asian". A human race is a variety of humans (Homo sapiens), distinguished by features such as skin color, facial appearance, shape of skull, type of hair and height. Races have generally been defined by some easily distinguished external feature. There have been various different accounts of racial origins. Some have led to racist attitudes, by which people attempt to characterise other races than their own as inferior. The differences between human races are assumed to arise in the same way as variations of other kinds of plants or animals. Separation will potentially lead to divergence that would theoretically lead to the formation of separate species. When evolution was first propounded as a theory of origins, it was almost universally assumed that different races were the product of evolution. Evolutionists applied the myth of progressive development and concluded that the white race was the pinnacle of evolutionary development and that other human races were less-evolved precursors of it. This was perhaps fed by a desire to justify their racist attitudes to coloured people, particularly since racism was used to justify slavery. Modern evolutionists deny that evolution supports racism, but this is more because racist ideas have become politically incorrect than because they cannot be derived from evolutionary theory. Skin hue of native populations. All people now alive are descended from the three sons of Noah and their wives, and ultimately from the first humans, Adam and Eve, who were directly created by God. The sons of Noah were alive around 4,500 years ago, and all human races have been derived from them. The Bible relates how their children founded various nations, which have spread out into various regions of the world. After the flood of Noah, people stayed in one area until God confused their languages at the Tower of Babel. This event induced the human population to separate into distinct groups, which dispersed across the world. In general, the sons of Shem gave birth to nations which include the Hebrews, Arabs, Assyrians, Persians, Syrians and others. The Hamites have included such great empires as Sumeria, Phoenicia, Egypt, Ethiopia, etc., and quite possibly the great Asian nations (China, Japan, etc.). The Japhetic peoples include the Greeks, Romans, Aryans, Europeans. Melanocytes produce the skin coloring or pigment known as melanin, which gives skin its tan or brown color and helps protect the deeper layers of the skin from the harmful effects of the sun. Aryan is a term used to denote an ethno-linguistic collection of peoples united as native speakers of the same Indo-Aryan branch of the Indo-Iranian family of Indo-European languages. A very controversial topic immediately adopting an occult stigma when it was written about as a root-race by Helena Blavatsky (1831–1891) and debated within the Theosophical movement of which she is one of the four original founders. She declared all other races essentially inferior or a lesser human physically and spiritually. These tenets of theosophy are said by Blavatsky to be derived from Far East teachings of Buddhism and Hinduism. Theosophy today in the 21st century is an integral part of the New Age movement. ↑ Morris, Henry M. The New Defender's Study Bible. Nashville, TN: World Publishing, 2006. p 44-45. One Blood: The Biblical Answer to Racism book by Ken Ham, Don Batten, and Carl Wieland. (Read free online). This page was last modified on 3 October 2013, at 07:08.